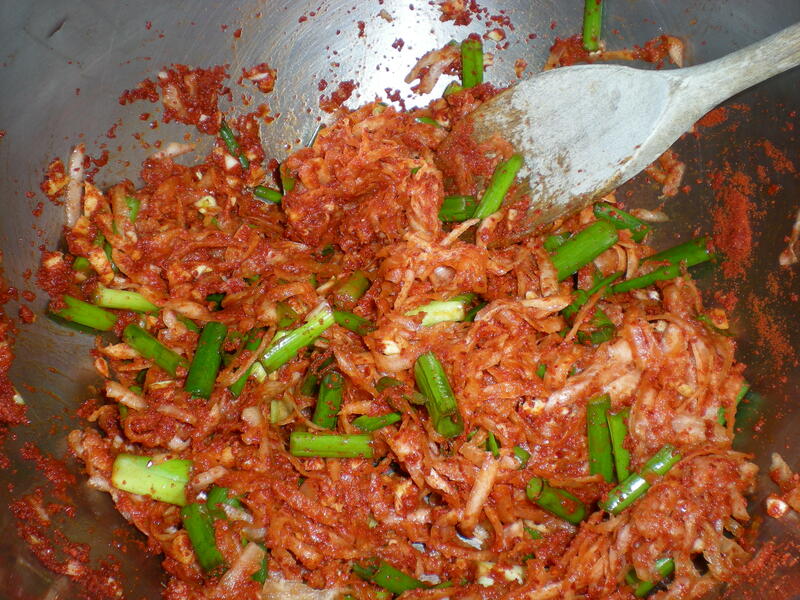 One of my recent cooking experiments was making Kim Chi. I had multiple motivations for undertaking this particular culinary adventure. 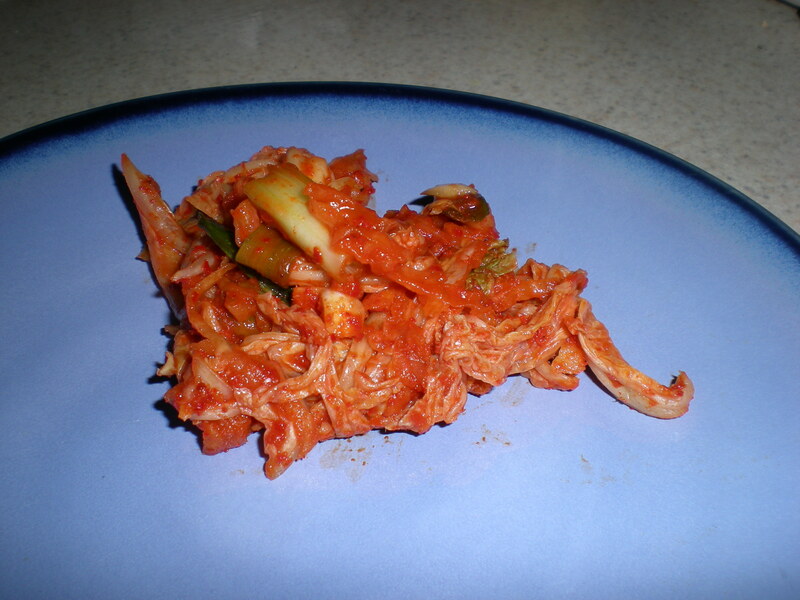 Fermented foods are healthy and delicious additions to the human diet. 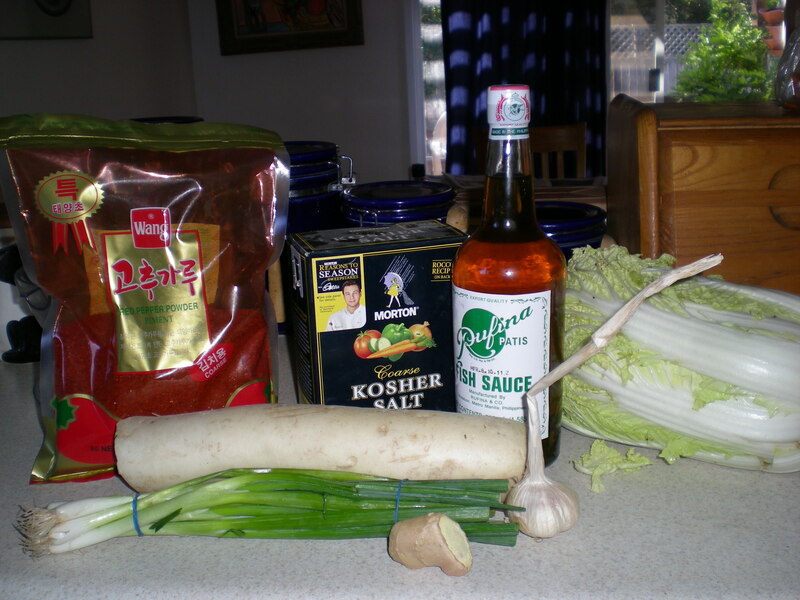 Fermented foods can help restore the proper balance to a person’s gut flora. This is particularly important if antibiotics have been used recently. I was attempting to recreate a food I had many years ago. When I lived in San Jose, my favorite Chinese restaurant was Kirin. They used to serve a small dish of Kim Chi on every table in the same manner that Mexican restaurants serve chips and salsa. I loved this stuff and have not been able to find anything even close. I thought it would be fun to mess around in the kitchen and ferment something. This is play for me. 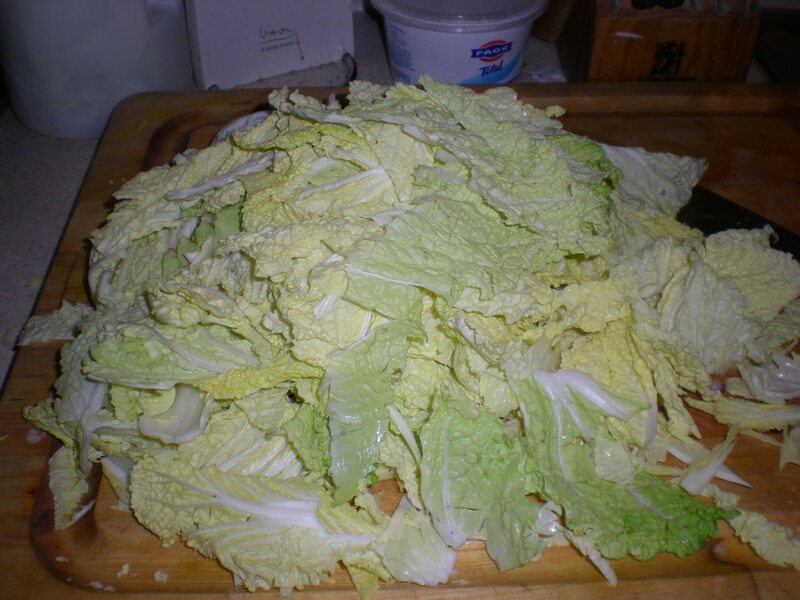 Slice the cabbage lengthwise in half, then slice each half lengthwise into three sections. Cut away the tough stem chunks. Dissolve the salt in the water in a very large container. Submerge the cabbage under the water. Put a plate or lid on top to make sure they stay underwater. Let stand for 2 hours. 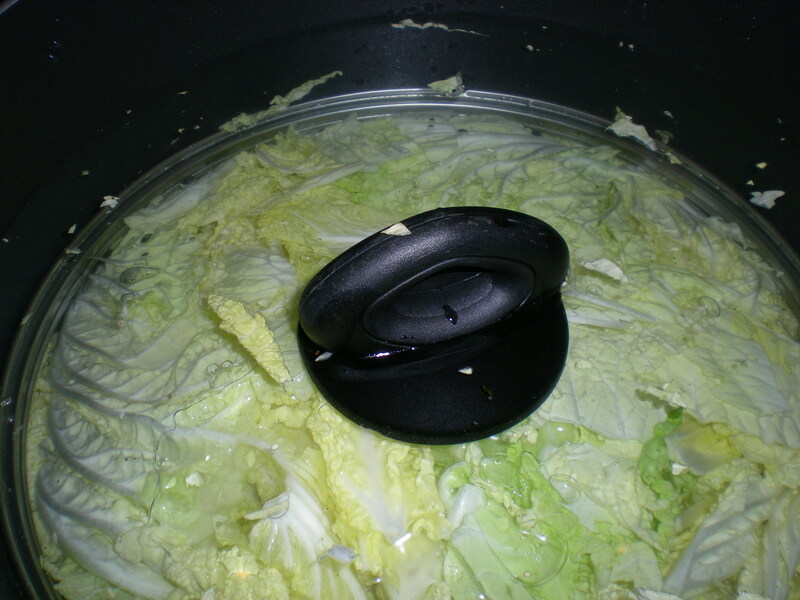 Drain the cabbage, rinse it and squeeze dry. Mix the cabbage with the other ingredients. Note: I found that this mixture was very delicious. You could stop here and serve it as a cabbage salad. I think that this is what that restaurant in San Jose was doing. 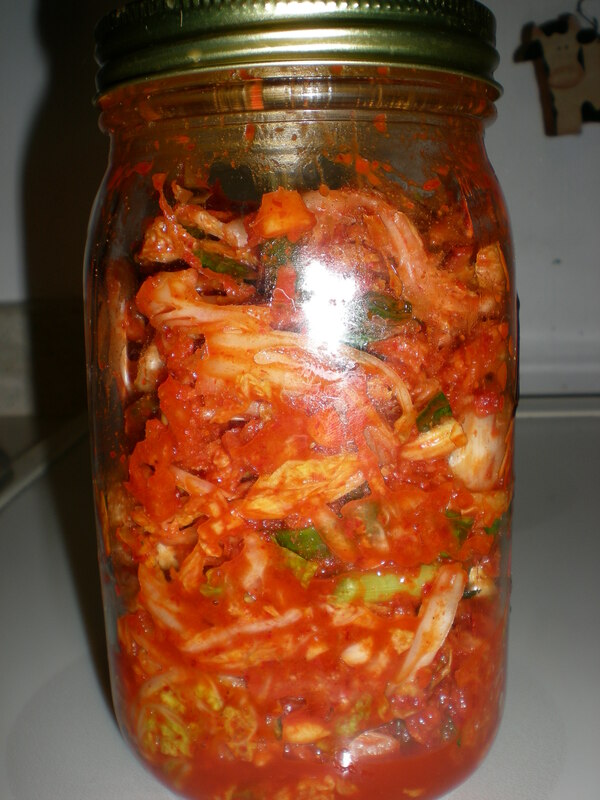 Pack the Kim Chi in a clean glass jar large enough to hold it all. Cover it tightly and let stand for 1-2 days in a cool place. Check the Kim Chi after 1-2 days. If it’s bubbling a bit, it’s ready and should be refrigerated. If not, let it stand another day, when it should be ready. Once it’s fermenting, serve or store in the refrigerator. If desired, add a sprinkle of toasted sesame seeds over the Kim Chi for serving. 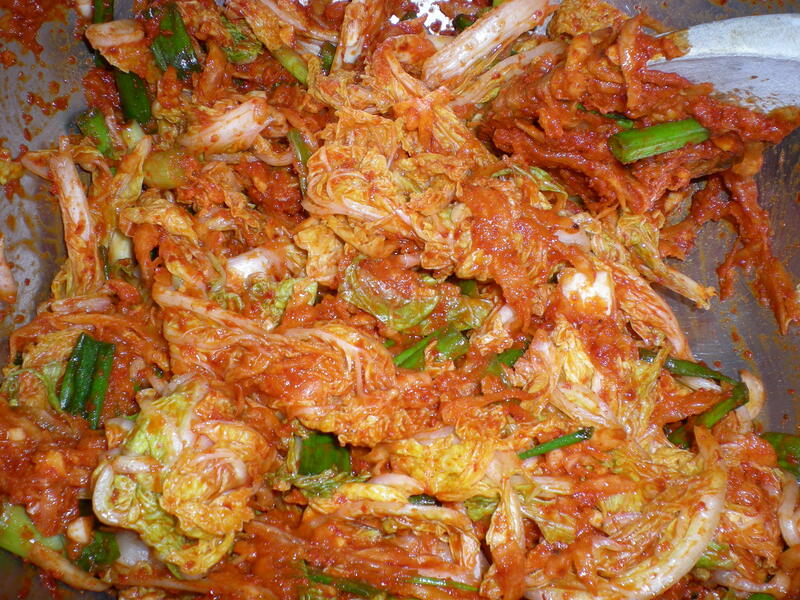 Many advise to eat the Kim Chi within 3 weeks. After that, it can get too fermented for most people’s taste. This recipe is definitely a keeper. I’ll be doing both the fresh and the fermented versions. This entry was posted in Recipes and tagged Cooking, fermented food, Kim Chi recipe, Low Carb, Paleo, Paleo diet, Paleo Recipe, Recipe. Bookmark the permalink. Okay, I have to do this right after I make sriracha…. I need your Sriracha recipe. I’m definitely going to try this one when empty my current bottle.